Need To Control Your Fan Speed? View our selection of fan speed controllers and other environment controllers that will automate your exhaust fan and more! 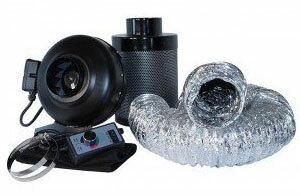 View our selection of ventilation kits that include a exhaust fan, carbon filter, fan speed controller and ducting! These kits are the perfect solution to poor ventilation, excess heat and unwanted odor! A proper ventilation system will make or break your grow room setup, and a ventilation system is not complete without inline fans. To ensure our plants have a constant supply of fresh air we need to use inline fans. An inline fan is a fan used to intake and exhaust air. In our grow room or grow tent, we want to exchange the air at least once every 3 minutes. An inline fan can bring air in, and send old air out through the intake and exhaust systems. Inline fans are also responsible for managing temperature and humidity levels in the growing space. These fans sit inside ducting in the ventilation system, or in the case of an air cooled reflector, right inside the hood. When sizing an inline fan, remember that it will sit directly in your duct work and thus it needs to match your system components. For example, 10" ducting will require a 10" inline fan. If you need an inline fan for your reflective hood, be sure the size matches that of the flange. Another important consideration is the CFM (cubic feet per minute) of the fan. This measures how much air the fan is capable of moving. To properly size an inline fan for your room, first find the cubic footage of your growing space. Since we want to exchange the air in our grow room every 1-3 minutes, a growing space of 100 cubic feet would need a fan rated 100 CFM. Some of these inline fans feature sound insulated walls, which cut down on noise drastically. 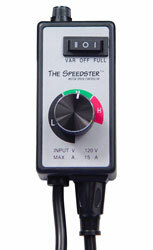 Another cool feature is a built-in speed controller. This allows growers to program the speed the fan works in accordance with the lights on/off periods, and with the temperature of the growing space. If your inline fan does not have one built in, you will need your own fan speed controller to automate this aspect of your grow room. Not sure which line fan is right for you? We can help! Reach out to our experienced growing staff at 888-815-9763. If you want to learn more about creating the best environment for your plants, stop by our learning center!